Design from pattern to details – nature is amazing, the shapes the forms from nature have been inspiring and informing construction craft and design for centuries. As modern building methods and details evolve it is important we honour and incorporate these previous generations designs solutions and artistry, but also look to nature to teach to inform new design. It is hard to conceive that our square boxed environments can be informed by the natural world but if you look hard enough the evidence is there. Heating and cooling systems, weather protection and even wall design have been inspired by the natural landscape whether by material or replication nature teaches us how to build sustainability if only we look. Name your permie hero? Why them? Peter Draper – Peter has been a huge impact on my life and started me on a path in the world of permaculture and sustainable building. Peter has been in the forefront of social enterprise sector in SE wales for two decades. 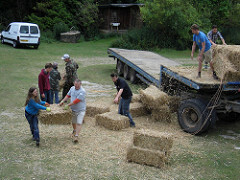 He has set up or been heavily involved in the grass roots organisations focused on permaculture and sustainable living. Namely he set up and runs RDE (Rounded Developments Ltd) which ‘Champions Sustainable Building in Wales’. Peter is amazing, passionate and knowledgeable, an honest hero who has worked tirelessly to push sustainability to the forefront of public consciousness. He gave me my first true opportunity in sustainable construction and with out him I would not be where I am today. Three years ago I had the honour of working with my students at the time on the Waste House Brighton. This unique structure was constructed almost entirely from waste material. Designed by Duncan Baker-Brown this building sought to close the cycle of waste in the the construction industry and other industrial processes. This project has inspired many but it has also brought the question of what is actually waste and what is another mans building material. 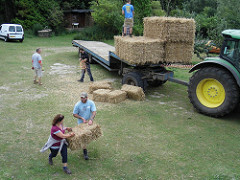 I work as a heritage carpenter and eco builder, but my favourite building materials are strawbales. They have some amazing properties and are undoubtedly environmentally friendly, but I mainly build with them because they are great fun to build with, just like big furry Lego bricks! Next course you are attending/teaching? 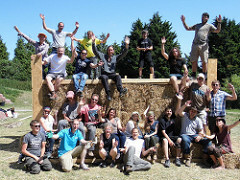 I will be teaching the -:- Strawbale building course on the 6th-8th April this year for the low Carbon Trust and Brighton Permaculture Trust.